If you are dreaming of additional living space in your current home, look up. That’s because many New Jersey homes have hundreds of square feet of attic space just waiting to be used. The experts at Monk’s can turn your unused attic space into beautiful, livable square footage. 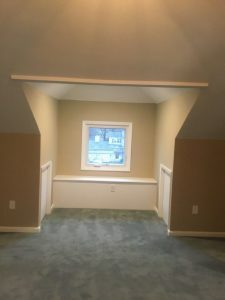 Many of our satisfied clients in northern Northern NJ have renovated their existing attics into elegant master bedrooms with adjoining bathrooms, state of the art theater rooms, home offices, and additional bedrooms for their growing families. So, what would you do with the extra space? At Monk’s Home Improvements, our expert project designers will work with you to create your new favorite room. 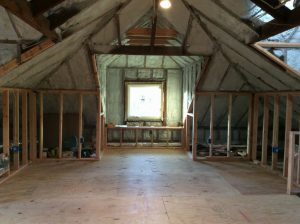 Thinking of finishing your attic space? Give us a call. Firstly, you’ll meet with an Estimator and discuss your project. Plus, if you are considering adding a bathroom or kitchenette, we also have showrooms featuring everything you’ll need. Our designers will work with you to layout your space, and select and coordinate your materials like cabinetry, tile, and flooring. We even have windows and doors, along with sales specialists who can help you find the perfect egress windows. For ideas and inspiration, view our gallery of attic renovations. Contact us today at 973-635-7900 to schedule a FREE project estimate for your attic renovation.